How much longer will we import feeder cattle from Mexico? 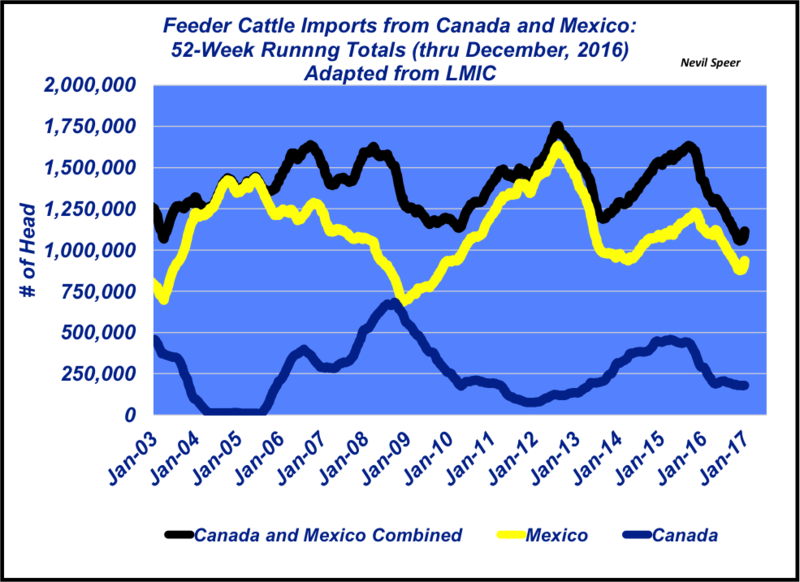 Feeder cattle imports from both Mexico and Canada were down in 2016. Will the trend continue? Last April, this column provided some focus on feeder cattle imports. The discussion noted that the focus on Mexico has become increasingly important, given increasing capability to both feed and process cattle. Those new capabilities result from SuKarne’s investment in the beef industry in recent years. To that end, SuKarne’s new beef operations in Mexico, with feeding capacity of nearly 300,000 head and a beef plant capable of processing more than 800,000 annually, have impacted feeder cattle imports making their way from Mexico into the U.S. This week’s illustration highlights the shift that’s occurred over the past year. Feeder cattle imports from Mexico peaked in the summer of 2012 – largely the result of severe drought in the country. The 52-week running total exceeded 1.6 million head in August 2012. Imports subsequently waned and then perked back up to nearly 1.25 million head, based on a 52-week running total, in October 2015. Since that time, though, there’s been a steady decline – Mexican imports of feeder cattle are now running closer to only 900,000 head on an annual basis. Meanwhile, imports of feeder cattle from Canada have also steadily declined from the near-term peak that occurred in March 2015. Through the end of December 2016, feeder cattle imports from Canada total only about 178,000 head on a running 52-week basis. In combination, feeder cattle imports marked a new low totaling just slightly more than 1 million head in late 2016. Meanwhile, the U.S. feeder cattle supply seems ample. However, the strengthening dollar encourages imports going forward. Where do you see feeder cattle imports headed in the coming year(s)? How might the Trump administration’s NAFTA policy further influence this trend? Leave your thoughts in the comments section below.